A couple of weeks ago when our family was visiting us in AZ, we were eating at our favorite pizza restaurant here in the Valley of the Sun. As we ate, I asked a variation of the age-old question: If you were eating your very last meal, what would you have? I learned several interesting things from that question. The first thing I learned is that if you’re going to try to ascertain the answer to that question from an 11-year-old boy, you’d better phrase the question carefully. I unfortunately worded it as such: Hey Alastair, if you were on death row and they were bringing in your last meal, what would you have ordered? Okay, okay; I admit that perhaps you shouldn’t ask a child any questions that relate to Death Row. Lesson learned. Because Alastair – who loves good food – couldn’t be pinned down to the food part and instead concentrated fully on the Death Row part. Despite my pressing him further and further, his answers continued to be along the lines of a cake with a file in it, or a piece of sausage in the shape of a key. 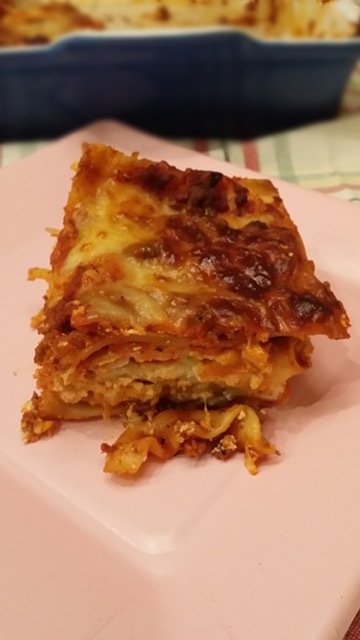 But the other interesting piece of information I learned, particularly once I rephrased the question to be if you were on a desert island and could only eat one thing, what would it be?, was that my daughter-in-law Jll chose lasagna. I thought about that conversation the other night when I cooked dinner for my sister Jen – who had arrived that day for a week’s visit – and her daughter Maggie and the family. I had texted the dinner invitation to Maggie earlier in the day, and didn’t know technology could work that fast when her response of YES! came almost before I set down my phone. Such is the life of a mother of two, including a very busy 3-year-old, as she prepares for the arrival of her own mother. I had some of my red sauce in the freezer, so making lasagna was going to be simple. Or at least as simple as making lasagna can be. As we sat and ate our lasagna, Caesar salad, and French bread, we learned that Maggie’s husband Mark would also choose lasagna as his last meal. Funny, that. I like lasagna, but who would choose lasagna when you could choose a wonderfully dry and ice-cold Tanqueray martini, a perfectly-cooked bone-in ribeye steak with a dollop of herb and garlic butter, a crisp salad with a mixture of homemade Roquefort cheese dressing and the homemade Italian dressing made by my favorite childhood restaurant Husker House, and crème brulee with that crackly burnt-sugar topping? As a result of Mark’s proclamation, much of our conversation at dinner that night revolved around making lasagna. I created a bit of a controversy when I admitted that while I liked lasagna, I found it a pain in the booty to make. Maggie was astounded. She doesn’t share my sentiment. But let me be clear. The most troublesome thing for me when it comes to lasagna is the noodles. Cooking lasagna noodles is flat-out messy. Dripping water, noodles splashing back into the cooking water as you try to retrieve them, noodles sticking together. All-around messiness. Maggie, however, uses the lasagna noodles that cook as your lasagna bakes. I’m all for convenience, but I fear that any kind of pasta that you put uncooked into a dish soaks up too much of the liquid as it cooks. So despite the ease, I continue to cook my noodles before I begin the layering process. I will admit that I like my lasagna very much. I use a meat sauce from my favorite Italian chef, Lidia Bastianich. It involves using pork neck bones, which result in the most flavorful sauce imaginable. Of course, no matter how careful I am, a few little bones will make it into the sauce. But the best part of using neck bones is that after a couple of hours, you remove them to cool. I, however, begin nibbling on them almost immediately, always burning my fingers in the process. Lidia’s sauce also involves ground pork and ground beef, so the flavor is delightful. Don’t tell Lidia, but sometimes I substitute Italian sausage for the ground pork. The sauce cooks for a couple of hours, making the house smell like an Italian home on Sunday. It’s pure heaven. Here is a link to Lidia’s sauce, though it doesn’t come from her website. As for the lasagna, just like dressing for Colorado springtime weather, it’s all about layering. Include as many layers as your pan will hold, and then eventually this happens…..
And maybe that is worth a last meal. It was so good! Kris, we both did a double take when Mark said this would be his last meal choice! That right there was a compliment! It was good, and the photo doesn’t do it justice. I love lasagna but would not choose it as my last meal. UNLESS JENNIFER MADE IT. Seriously, your family makes some amazing lasagna!